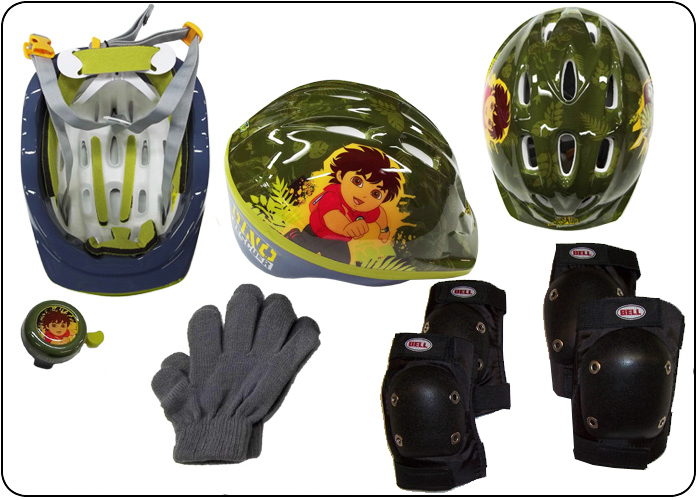 This set includes a premier Brand Toddler Sized Bike Helmet. Helmet has a padded and foam inside with (4 point) adjustable straps and adjustable size-frame in helmet. Helmet is decorated in a dark green color and features Diego and a Dinosaur on a background of leaves and dinosaur bones. Includes the Pro-Style Pad Set in a Toddler Size; knee pads, elbow pads and wrist pads. Pad set is in a (black, gray and red colors) all of the Pad Set matches. Pad Set features quick-adjust high performance Velcro for adjustment and fit. Elbow and knee pads have durable pvc centers and soft foam back sides for comfort and protection. This set also includes a pair of our small Stretch Gloves in a nice gray color. Machine washable and can be put into the dryer. Keeps hand toasty warm and will stretch with your little one.